While I check a few websites for news each morning to see what’s going on in the world, it’s nothing compared to what happens to me every four years when the presidential election comes around. From the time the primaries hit to the time the electoral votes are counted, I’m a total news junkie constantly gleaning info from political podcasts, cable news and the web. I thought I’d be happy once the election ended so I could get back to my regular podcasts and programming, but the withdrawals have hit me hard since Tuesday, probably because of the ups and downs and dramatic turns of this year’s race. Or maybe because I’m spending more time at home and am loaded up with all the news, analysis and punditry my brain can handle. Whatever the reason, I hope I can wean myself from all this election coverage so I can enjoy the upcoming holidays without checking the web or turning on the TV. So how ’bout you BOTreaders? Do you become news junkies when something big happens or when it’s time to elect a new fearless leader? News junkies all the time? Or hate the news and actively avoid it? Honestly politics are pretty predictable where I’m from. Whoever is known more wins. very true in most elections, ROM!, sadly. And those old strips are real different in terms of art style. heheh. I’d say it’s a lot better now because of the details, shadows, etc. yeah, it’s kinda crazy how my artwork has evolved over the years. glad you think it’s for the better! Um. Wean, not ween. Sorry, I’m doing NaNo right now, and that was driving my typo-brain crazy. Normally, I try to avoid watching much news. It’s either depressing or infuriating, or sometimes both, but I found myself reading the newspaper today. Like, actually reading multiple articles. Not that it wasn’t depressing: the sum total of what I learned is that the Republicans have a fifty-fifty chance of getting even more extreme than they have been lately, I still can’t get married, and I’m one state too far south to console myself over these facts with legalized drugs. Also, I’m now going to pointedly ignore these particular comments, because what I read earlier today was basically the trifecta of argument-starting issues. Really sorry about that. fixed! thanks for the alert, Drakey – my familiarity with the band Wean overrode my brain’s autocorrect. It’s hard to imagine you riled up, Jeff, so obviously your veil of neutrality on JEFbot has been successful. However, given that you do have a public forum here, would you ever speak out on something political that was really important to you personally? Not in the strip itself, necessarily, but perhaps in a separate blog entry? I agree that in-your-face invective is rarely fruitful, but when you talk about how an issue affects you, your family, or your friends as individuals, sometimes it can get opponents to re-examine their positions. Or do you think you’d just be preaching to the choir here? and it’s possible i’d speak out on something political in the blog or strip in the future. anything’s possible here. Not usually, but this year the american elections were more important than ever. At least according to me. I am not too much for news, but the memes that are created online during elections are impossible to ignore. Like many europeans, I was cheering for Obama. Lets hope that in four years, America wont be a little, but much better. yes! hoping for “much better” too, DAS! and i’m always intrigued by how the rest of the world views the U.S. so thanks for posting your view on the election. I tried to keep up with everything, I knew who I was voting for way before the election and unless he did something really horrible I was still going to vote for him. And, to be honest, after a while all that stuff becomes background static to me anyway. i think most people know who they’re voting for way before the election too, TPC – with the undecideds shown to great comical effect on The Daily Show and SNL. OK so it’s official, we are almost totally moved out of the hell hole into our adorable little home that needs a little work. Ok, Ok, so we don’t OWN said home but hey I can dream. And Now the unpackening *phuquing Phaints! * GUH! It will be like Christmas as in YAY! And then Holy Poop where do I put this?! Anyway, GOOD MORNING BOTIVERSE!!!! Oh how I’ve missed you!!!!! *tosses a steak to the rabid fans* Mummy’s lil babes! About the comic? I was so tired of all the political crap 3 weeks ago that I just started marking everything spam on Facebook that I saw was a campaign ad of any sort. On both sides! It drove me crazy. I don’t care who you voted for. We need to come together and make this a better America as Americans, not as Republicans or Democrats, Liberals or what have you . Enough is enough already! and: true. all the political stuff in my inbox on both sides needed to stop long ago. and i’m afraid to even look at my Facebook page – the last time i looked, it was a sea of people’s politics, and i had to stop myself from wading in! also true: democrats and republicans need to come together to help out the country. enough with the crazy ideology and non-compromise. and you know your soapbox is always welcome! When you refer to “your” Facebook page, I think you mean your News Feed, because your Wall (or Timeline) has only one recent posting, that I made a week ago, which I hope you found amusing, since you haven’t acknowledged it yet. Insert a smiley there, Jeff… just givin’ you the business. haven’t been to my FB page in weeks, Kim, so i’ll have to check to see your posting. I don’t even have a TV and it’s been ages since I head a radio station (glances at Zune mp3 player fondly). I hardly even read the newspaper (printed or online). Life suxs all around. I rather have a pleasant day without the stress of the world falling on me. most of the radio i listen to is either through my iPhone or recorded podcasts these days, JCB. and i now read the paper mostly on my iPad. but yeah, either way you listen or look at it, there’s a lot of bleakness around, but some good stuff, too! i love checking in to see how the Mars rover’s doing and articles about all the new breakthroughs in science and technology that seem to happen every day! fortunately, living in California means that it’s a given who’s going to win our state, so we aren’t as inundated with the attack ads here, dj. i’ve seen some of them on the web, though, and they ain’t pretty. can’t imagine being deluged with them day-in and day-out. Michigan is generally a blue state because of the high population of African Americans and other minorities, add in women. Most definitely blue. Moving to the opposite side of state has cemented my liberal view, conservatives scare me. 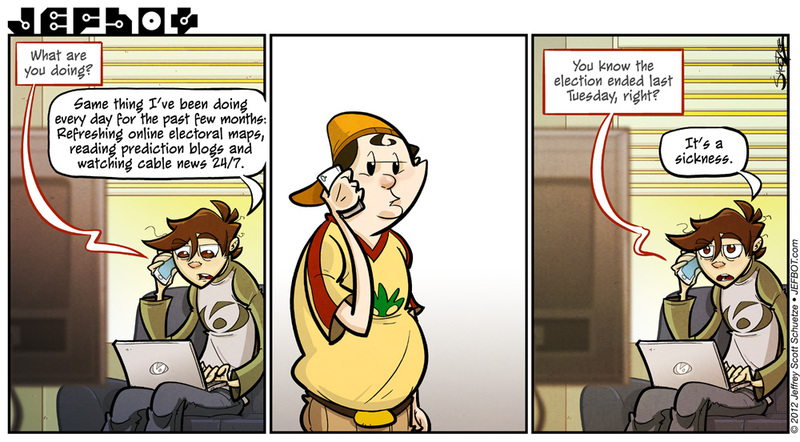 Wow I refreshed your earlier Election-themed strips and the change in style while still being the same is unbelievable! it’s still a shock for me whenever i look back at old strips, Maryz! many times i’m like: what was i thinking?? heheh. i’m just happy i feel like i’m learning and getting better as i continue to grow with the strip. I get almost all my news from NPR, which is usually great, except when it means that I have missed something important locally. It was fun to go back and look at your early strips again and remind myself how much you have grown as a webcomic artist. i get a lot of news from NPR too, Shanna! mostly through their podcasts. would’ve hated to see that institution go away, especially when it wouldn’t have impacted the budget much. and as much as i’m having withdrawal symptoms now, i’m glad the election’s over, too. i was getting too much anxiety from the campaigns. thanks for the compliment! i seriously can’t believe i’ve been doing JEFbot now for 5 years! yow! I make an active effort to give no fucks about the news. I voted obama, obama won, yay. so yeah, more time for the big guy, because he’s proven himself so far for war, efforts for health care, honesty, and more. That story isn’t true, about the W key and all. Although some of the keyboards had the W removed it was just a harmless prank by a few people. while i appreciate your passion, clockworkAngel, and actually agree with many of your points, your choice of language and extremism does nothing to advance your cause and will most likely turn people off, even if they might’ve listened to you. Aaaand this is why I don’t talk politics with people. Oh and thanks for pointing these things out tho. a friend of mine linked me to an interesting article recently. It seems that the second rmoney knew he lost the election, he cut off the credit cards of all his staffers unnecessarily. He left many people stranded and penniless in places far far from home, with no other access to money, and no source of income. He basically screwed the lot of them. And it’s honestly worse than I’m making it out to be here, because I’m trying to avoid more excessive language, but…yeah. That’s the kind of guy that almost got elected… seriously. The moment the cameras were off and turned away from him and he lost, BAM. His true face shows. I shudder to think what he’d have done if he won. i’ve read similar articles, clockworkAngel, and while there are many issues i have with Romney, i doubt he personally put out the order which cut off finances and stranded his people. more likely a person in charge of money or a staff member did it unthinkingly (and unfeelingly.) now, i’m not agreeing with what happened (i actually think it’s horrible), but there are a lot more substantive issues as to what’s behind Romney’s real character than blaming him for how his campaign shut down. Rightyo, Bot needs a wake-up call. Someone get the JB Harem on the line! ha! yeah, he either needs the harem or the Cornfather to get over there and pull the plug on all his gadgets, Anime fan! I work in news, so I can’t avoid it anyway. oh, man – i feel for you, Striker! Totally off topic, but I went back to those two entries from 2008 and was struck by how different the art looks from then, to now. I’m always fascinated with the artists mind and I would love if, some day, you could, I don’t know, show us how your art has involved? Not even sure how to go about doing that but your such a better artist now than then (and it wasn’t bad then either ) that I think it would be really fun to see. I was so delighted to see this! When Tuesday’s cartoon wasn’t election-related, I was afraid there wouldn’t be a follow-up to your awesome “I Voted” strip of November 4, 2008. I’m surprised you didn’t provide a link to that in your commentary above; it’s one of your best! glad you liked that one, Kim! here’s the link for people interested: JEFBOT.91_I Voted. Oh, and Jeff, if you want to watch something that might take your mind of politics for a little bit watch Raised by Zombies on YouTube. It’s a very well made little series that I’m sure most people here will enjoy. Raised by Zombies? hmm… thanks for the link! i’ll be checking that out soon. It really is a sickness, especially on Facebook. I want my friends back! ha! i concur, Sarah W! I generally use the News as background noise while I’m reading through the comics and, once in a while, pay some actual attention if an interesting story comes on. As to the elections; I certainly paid more attention than I normally do to that kind of thing. My BS meter tended to go off the chart whenever either RoMoney or one of his surrogates let out a whopper (I swear; if Burger King had given out a free Whopper every time the Republicans had let one loose, they could probably have fed every child in every school lunch program in every school in the country for the next year or so! ), and the snark-producing portion of my brain is going to take *at least* few months to recover from being in overdrive for so long. So, yeah; I might very well qualify as a news junkie — a reluctant one to be sure — but a news junkie nonetheless. i wish i could use the news as “background noise,” r61! even if i know everything about the story they’re covering, i get too distracted to do anything requiring concentration, like reading or writing. I like the middle panel here. The look fits the Cornfather really well. since i had such a long drive to work, i used to listen to podcasts like Left, Right and Center, T – but now that i’m home all the time i think it’s gonna be mostly cable news and websites from here on out, sadly. i’ve heard Jerry Doyle’s show a couple times, but i’m not really on his political wavelength (although i loved him on B5!) so haven’t listened much. and, surprisingly (being a Los Angeles native with strong ties to the acting/arts community) i find myself arguing – err… conversating – with right wingers more than you’d think! In my senior year I was teacher’s assistant. The first thing I’d do after checking homework was go to yahoo and msn and read the news. I was so into it I got in trouble for zoning out! Totally need to catch up here. Looks as good as ever Bot. awww… thanks, Eptha! glad to see you back here! …but what happened to your cool avatar? For the longest time, I couldn’t figure why my Gravatar didn’t show up. Turns out that I’d left out a character in the auto-fill. Took me a month to figure out. I live in a swing state, which means for several months I constantly get bombarded with political adds and phone calls from surveyors. It’s irritating beyond words, no matter what your party affiliation is. Thus, November 7th is my favorite day every four years- despite whether or not the guy I voted for won. ugh. i’m so happy i’m not inundated with the ads and calls you were subjected to, Soul Man. i’ve seen some of them on cable news and the internet and yeah – both sides got pretty ugly. glad you’re rid of that for the time being! I totally get it!!! I was addicted. glad you could relate, FunnyShaffer! California has too much voting power. Unless the Republican candidate already has it in the bag by the time the Pacific time zone closes out, it’s a lost cause. I would still think it has too much voting power, even if Republicans moved there en mass and upset the Democratic majority. Wouldn’t have helped the Republicans this year anyway, but maybe if we had a strictly popular vote, more than 35% of Americans would bother voting about regime changes. Rant complete. i’ll agree that a candidate winning the Electoral votes but not winning the Popular Vote (a la Bush in 2000) is disconcerting to say the least, Bender_Sastre! and anything to increase the turnout for voters, including ending the voter suppression schemes that keep popping up in the past few elections, would be spiffy.